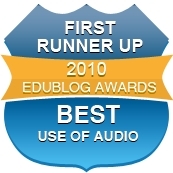 Our 26th podcast brings together in one handy file seven more brief talks from the Patterns of Poetry series, which was runner-up in the 2010 Edublog Awards in the category 'Best Educational Use of Audio.' The talks are, in order: (9) Rhyme, (10) Repetition, (11) The Sonnet, (12) Punctuation, (13) Foreshadowing, (14) Metaphor, (15) Hyperbole. Note that there is a brief pause between each talk. The first 8 talks are available in a single podcast here. You can also listen to this podcast via the 'widget' on the sidebar to the right, or by visiting our podcast page here (if you have iTunes on your computer you can also subscribe by clicking here, and so download our episodes to your MP3 player, or by searching for 'SCC English' in the iTunes Store).